Burger craving satisfied. And how! The Hoxton Grill has come up in conversation a number of times in the last few months, but I never got around to going to it somehow, so when it was suggested as a probable dinner destination for an impromptu catch up with peeps from my previous workplace, I was thrilled. A full-on American diner, with plenty of chic thrown in. Sprawling spacious interiors, classy red booth seats, candles, and a menu promising plenty of cheese & grease. What’s not to love? We started off with a platter of calamari rings, corn fritters and chicken wings. I have to admit I'm a little fussy about my calamari rings - they need to be perfectly crisp and need to crunch softly when I first bite into them. There’s only one place I’ve been to so far that’s done them just the way I love them. The Hoxton isn’t it, but the garlic mayonnaise more than made up for any batter failings. The mains on offer were quintessential American grill. Burgers, steaks, ribs, chops. And some mac and cheese, fish and salad chucked in. Everyone decided to do burgers. I went for the shrimp, never having eaten a shrimp burger before. That burger made me very happy. 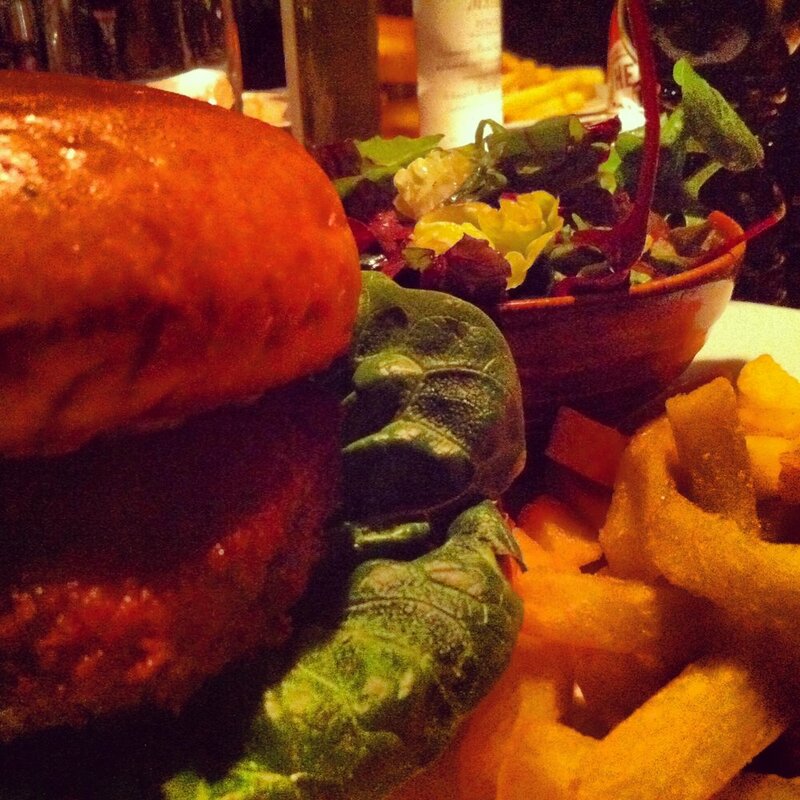 Massive, juicy, the minced shrimp patty beautifully flavoured, the bread soft and the chips perfect. My mouth’s watering just thinking of it. And for how stylish it looked, the Hoxton didn’t really pinch the pocket. I was surprised! I’d definitely go back. And not just for the food. I really enjoyed the large and airy dining area - it lent a lovely relaxed feel to the restaurant. Great after a manic day at work.